To improve the way pharmaceuticals are procured within Central Coast Local Health District (CCLHD) and remove inefficiencies from the process. To increase staff satisfaction with their involvement in the selection of pharmaceuticals from 10% to 50% in two years. To improve purchasing processes with pharmaceutical companies. Improves adherence to procurement guidelines. Enhances patient and staff satisfaction with the selection of medications. Increases patient and staff engagement. Streamlines the process of procuring medications. Improves the availability of medication for patients. Optimises expenditure when purchasing medications. Improves communication with prescribers about medication availability. 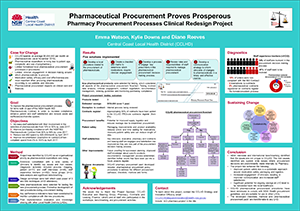 A model of care review in November 2015 revealed an opportunity to review the pharmaceutical procurement process in CCLHD. Around the same time, a financial analysis indicated that pharmaceutical expenditure in CCLHD was rising, due to the high cost of new pharmaceuticals, an ageing population and an increase in patients requiring many medications due to multiple medical conditions. The selection and purchase of medications can impact patient safety, length of stay, length of time waiting for medication in hospital and level of medication wastage. The old medication procurement process did not consistently involve prescribers and clinicians in the decision making process. It was primarily conducted by the pharmacy department, which did not take into consideration the challenges involved in purchasing medications. A literature review and discussions with hospitals in NSW, Australia and New Zealand between May and July 2016 revealed that other local health districts had similar difficulties. At the time, there were not many processes designed to manage pharmaceutical procurement and no one process that covered the entire procurement process. The following key issues were identified as a result of the literature review and discussions. Process: There was no formal process in place that considered patient benefits, prescriber choice, cost and logistics when negotiating contracts and deciding which medication to purchase. Participation: The decision as to which medication to purchase was often made by pharmacy staff and did not involve doctors, nurses and other stakeholders. Pharmaceutical companies: The communication and negotiation process with pharmacy representatives was not clear. Communication: The communication strategy to inform staff what medications were available, changes to products and issues with availability was not effective. Access: Access to medications was often delayed due to ordering processes and deliveries from pharmaceutical companies. Cost: Negotiations on the price of medications could be improved. Key stakeholders were engaged in a variety of solution design workshops using Power of Three and Blitz techniques. They identified the following solutions. Development of a Pharmacy Procurement Pack that contains policies and procedures, consent forms, conflict of interest forms, checklists and flowcharts on how to procure medications. Development of a Clinician Engagement Matrix that determines which medications required clinician engagement, taking into consideration medications that are high cost, high risk and high volume. Identification of staff that need to be involved in the decision-making process and employment of pharmacy procurement officers to oversee the procurement of medications in CCLHD. Establishment of a Pharmacy Procurement Planning Committee to make decisions about pharmaceutical procurement and identify medications that will be coming off patent. Development of a communication strategy to inform clinicians of the changes to medications and procurement outcomes. In February 2016, three of the nine pharmaceutical pilot products were procured, with work commencing on an additional two products. CCLHD saved approximately $150,000 per year on the first three pharmaceutical contracts that were negotiated as part of the pilot study. The initial pilot conducted with three medications showed there was increased staff satisfaction with the new communication and procurement process. As of February 2017, the Pharmacy Procurement Pack is in development. The policy and a number of procedures have been documented for products off contracts with sole and multiple suppliers, compounding and products on state contract. Contracts will be monitored on a monthly basis, as part of the project’s performance reporting framework. Compliance with new procurement rules and guidelines will be monitored by the contracts and leasing department. In June 2017, an evaluation of cost savings, staff satisfaction, number of clinicians engaged, number of communication strategies reviewed and number of contracts reviewed will be undertaken. A full evaluation will take place in April 2018, to see whether the objectives of the project have been achieved. Pharmacy had a number of competing priorities and this led to additional demands on the service. The renewal of the pharmaceutical state contract and stock availability was challenging in the light of contract compliance. Stock availability meant the contracted products were frequently unavailable or in short supply. This can impact contract compliance, as it is difficult to identify in the data. Clear and concise communication is essential to make sure everyone involved is aware of the project’s progress and requirements. It is important to set clear expectations of key participants in the project. Strong leadership at the executive level is required for system-wide change to occur. It is crucial to include a legal specialist in all procurement negotiations. A structured and consistent approach minimises the risk of products and issues being overlooked. Change management and constant communication are crucial when you are changing processes. NSW Ministry of Health. Policy Directive: Goods and Services Procurement Policy (PD2014_005). North Sydney: NSW Health; 2014. NSW Therapeutic Advisory Group Inc. Pharmaceutical Industry and Hospital Staff Liaison in Public Hospitals. Sydney: Clinical Information Access Portal; 2008. Sydney Local Health District. Guideline: Pharmaceutical Industry Representatives. Document number GL2013_001. Camperdown: SLHD; 2013. United Kingdom National Health Service. Patient Safety: Tools and Templates. Nottingham: United Kingdom Medicines Information; 2006.